Click on 5th ID Coin above for a more detailed view. My FCC issued callsign is AB9M. Now isn't that the truth? In many organizations new and different ideas are difficult to implement due to organizational inertia or momentum. 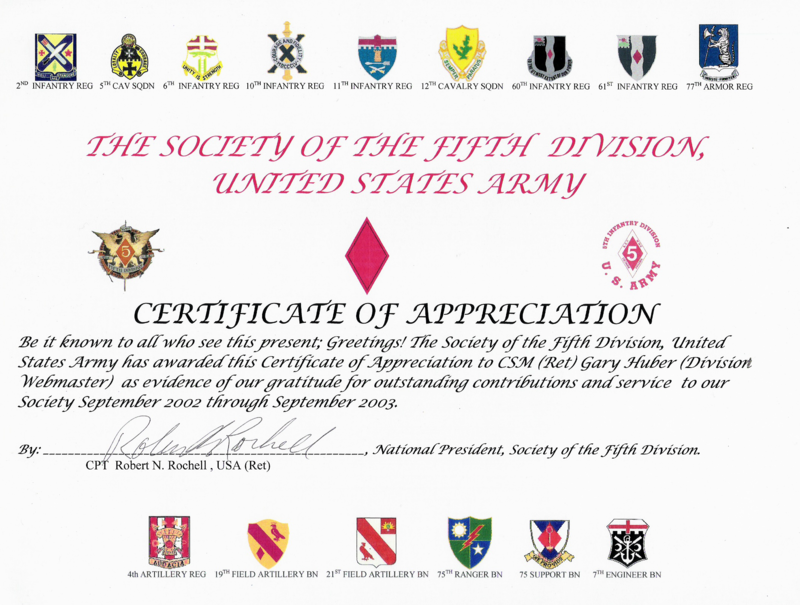 As a retired Command Sergeant Major (US Army), I have training, knowledge, and experience working with senior officers and their staffs to accomplish rapidly changing organizational objectives. As a retired Staff Assistant (State Farm Insurance), I have a wide range of experience and knowledge in industrial technology, telecommunications, radio communications and associated fields which have seen rapid change during the past twenty-five years. I am now retired and no longer available for hire. I may provide "pro bono" advice to qualifying organizations or individuals.... contact me for details. The 5th_ID_Coin is no longer available. I have sold or given away four hundred coins. The dies for the coin have been destroyed and I have no plans to create a new coin.